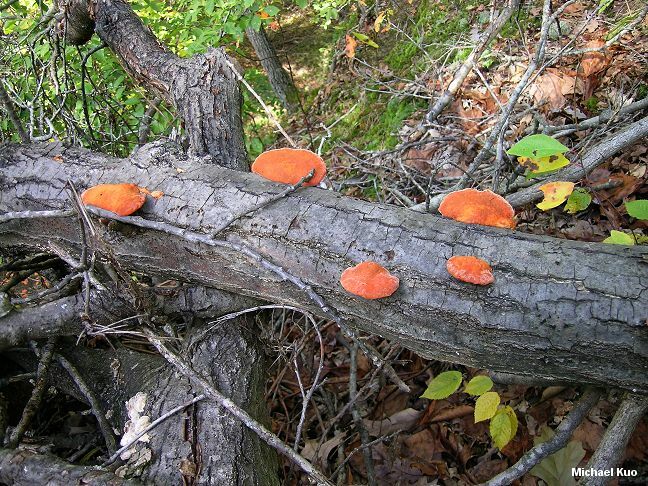 In my area (central Illinois) I have only found Pycnoporus cinnabarinus twice in 15 years--both times on trunks of fallen trees in the year after they were toppled by a tornado. 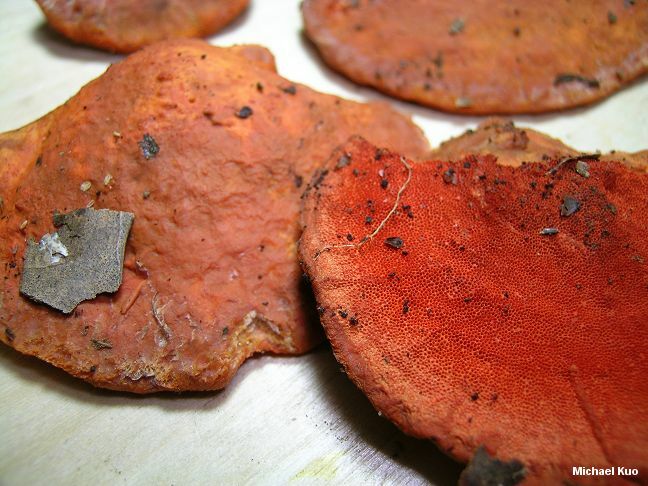 It is a pretty unmistakable mushroom when fresh, since bright orange colors are fairly rare among the polypores. 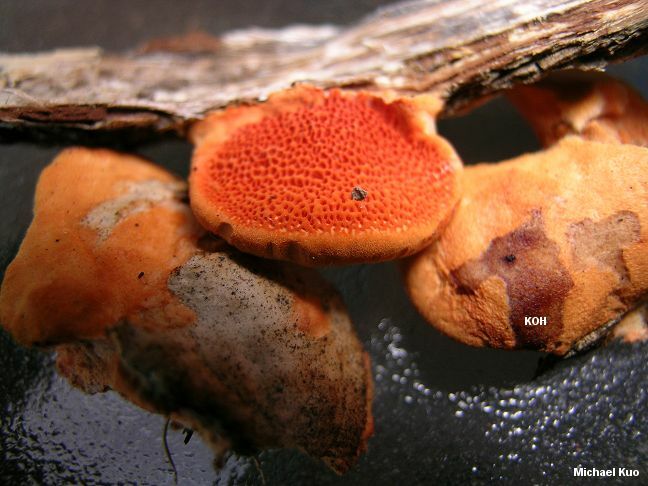 Look-alikes include Hapalopilus nidulans, which is dull orange, stockier and usually smaller, and features a dramatic purple reaction to KOH; and Pycnoporus sanguineus, which is thinner and more brightly colored, and features a shinier surface that is distinctively "seared." In the Colorado Rockies--on both the eastern and western slopes--I find a diminutive version of Pycnoporus cinnabarinus with regularity, usually on small, fallen branches of Gambel oak and other hardwoods; the caps typically measure 1.5-3 cm across. Ecology: Saprobic on the dead wood of hardwoods (usually with bark still adnate) and rarely on the wood of conifers; causing a white rot; annual; spring through fall, or over winter in warm climates; widely distributed in North America. 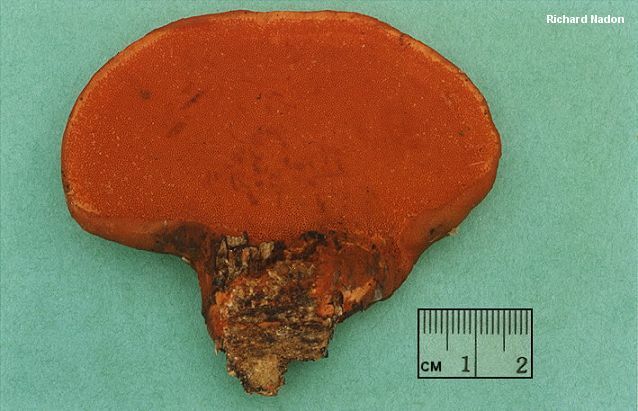 Fruiting Body: Semicircular to kidney-shaped; planoconvex; 2-13 cm across; up to 2 cm thick; upper surface finely hairy to suedelike, becoming roughened or nearly smooth (often pocked in age), bright reddish orange to dull orangish with age; undersurface bright reddish orange, with 2-4 round to angular (or sometimes slot-like) pores per mm, occasionally extending onto the substrate below the cap; tubes to 5 mm deep; stem absent; flesh tough, reddish to pale orange. Odor and Taste: Odor fragrant or not distinctive; taste not distinctive. Chemical Reactions: Cap surface purplish to reddish, then gray to black with KOH; pore surface olive green with KOH; flesh slowly reddish to blackish or in older specimens yellowish with KOH. Microscopic Features: Spores 5-8 x 2.5-3 µ; smooth; cylindrical or long-elliptical; hyaline in KOH; inamyloid. Hyphal system trimitic. Cystidia absent. REFERENCES: (Jacquin, 1776) Karsten, 1881. (Fries, 1821; Quelet, 1886; Saccardo, 1888; Overholts, 1953; Smith, Smith & Weber, 1981; Arora, 1986; Gilbertson & Ryvarden, 1987; Phillips, 1991/2005; Lincoff, 1992; Horn, Kay & Abel, 1993; Barron, 1999; Roody, 2003; McNeil, 2006; Miller & Miller, 2006.) Herb. Kuo 04109501, 07280603, 08160703, 10110903. DBG RMNP 2008-093.